Great effort under the circumstances, I'm sure with better luck next time a win for sure, good luck..
Won over 1950m at Yarra Valley today - winkers went on and he unexpectedly went straight to the front, still has a lot to learn but held on for a tough all the way win - very happy! Star racing in Hobart 4-34 pm. Travelling down to 30 degree heat the only concern. Good luck Slowdown, 34 degree always tough at this time of year for travelling. Do you have the ice water tank/ hoses available down there? Cheers Gaj, handled the travel and heat well. a good wash on arrival and she was very settled. Rebel running 9-30 tonight. has had two trials for two seconds. might find a couple tough to beat but should run top five. Fingers crossed for a good show, Slowdown. If you’re looking for someone to vote for in the All Star Mile , please consider Mr Money Bags - he is an absolute ripper and loves the Flemington track. Crack The Code and Social Spin - both very well backed, so here’s hoping. 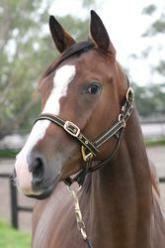 Ohm’s Law will make his debut tomorrow at Geelong - needs racing. Stayer in the making. Think Babe goes to Sandown - Monday. Out to 1400 getting closer - has had a lot of issues. Congrats Tillyras. what a buzz !! Mr Money Bags goes around at Caulfield today in the last. Hopefully he can pick up a few more votes with a good run. thanks very much Gay - the normally quiet members area got a bit loud! We have Mary's Girl racing at Ballina today, R4, she is resuming from a spell. Yes thanks Shrunk in wash, but not normally an issue for her, was buffeted badly at the start, but really not herself today, had some heat stress post race, won't race her again till it gets cooler.